The Weather is fine, the track is rated a Good 4, the rail is in the true position and champion mare Winx has ticked all the boxes on race morning before she heads to The Valley for the running of the 2018 Group 1 $5m Ladbrokes Cox Plate (2040m). Winx, above, is the short priced favourite for the 2018 Cox Pl;ate at The Valley. Photo by Steve Hart. Trainer Chris Waller tweeted this morning along with a video of Winx of doing her early morning exercise that the mare had ate all of her dinner overnight, that her temperature was normal and everyone in the Waller camp is happy heading to The Valley today to see Winx attempt to win her fourth consecutive Cox Plate. “Early morning canter, tick, Ate dinner, tick, Temperature, tick, Everyone in the team happy, tick. Thanks everyone for all your support,” Waller tweeted. The world’s number one rated race horse is as the short quote of $1.22 at Ladborkes.com.au to find the Cox Plate winner’s stall again, way ahead of her nearest rival in the betting Benbatl at $8.50. On the third line of betting at $17 is last year’s Cox Plate runner up Humidor while Winx’s stablemate D’Argento is listed as one of the outsiders of the field at $34. 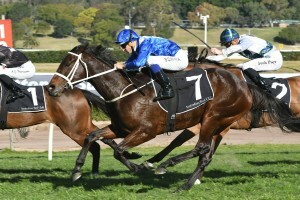 Regular rider Hugh Bowman is in the saddle again and Winx will jump from barrier six in the eight horse Cox Plate field and as well as trying to re-write the history books with a fourth straight Cox Plate victory, Winx is also saddling up for her twenty-ninth straight win and overall win number thirty-three.